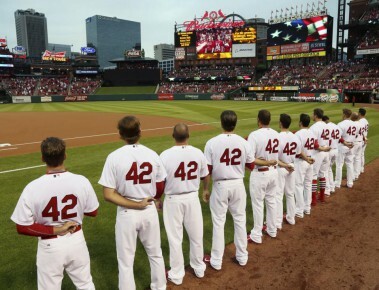 There were pluses to the Cardinals win over the Brewers last night on Jackie Robinson Day. Just winning (duh) is one, and it was good to see the offense have 10 hits as well as cut back the number of runners left on base to 7 (an improvement over Monday’s 12) and go 4 for 11 with runners in scoring position (better than Monday’s 2 for 13). Also a positive was that Lance Lynn only allowed 1 earned run while giving up 6 hits, walking 1 and striking out 4 even though he threw 99 pitches in just 5 innings. And Mike Matheny’s new Tony La Russa-like rotation of relief pitchers into games paid off too — Seth Maness, Matt Belisle, Randy Choate (yay, actually being a LOOGY) and Jordan Walden combined for 3 scoreless innings and allowed 3 hits. And while we never like to see Trevor Rosenthal allow a lead-off walk, it’s certainly not something we haven’t seen before. We’ve also experienced wild pitches on occasion and, unfortunately, Ryan Braun driving in runs. Just this once, since the game was on April 15, we’ll be OK with it. A final score of 4-2 on Jackie Robinson Day, when all the players are wearing No. 42 in honor of the Hall of Famer, is a nice tribute. There is a Cardinals connection to Robinson becoming the first African American player in MLB, since he was signed by Branch Rickey, who had a long history as Cardinals manager and general manager. Read more about it in this post from a few years ago. It’s a quick turnaround for more baseball, as the Brewers and Cards close out this series this afternoon at 12:45 p.m. With a win, the Cardinals will tie the first-place Cubs (ugh, it’s true, in case no Cub fans have yet gloated to you about how they’re doing even before KRIS BRYANT!!! arrives) with a 5-3 record. Mike Fiers and John Lackey are the starters. Mr. Lackey, please be better today than your first start. Mr. Fiers, you can just stay the same. This entry was posted in 2015 Cardinals and tagged Branch Rickey, Jackie Robinson, Lance Lynn, Trevor Rosenthal by Christine Coleman. Bookmark the permalink.